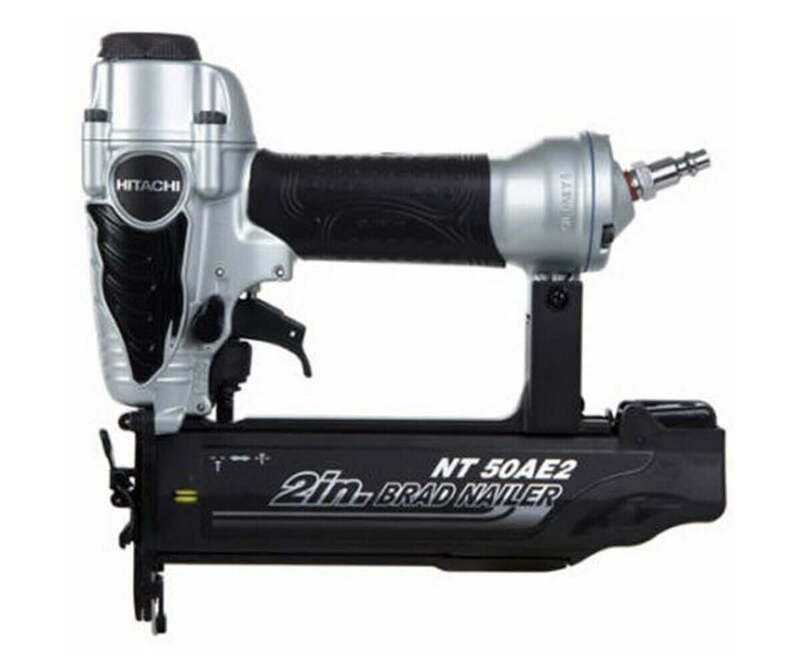 We found a top of the line pneumatic brad nailer for your next trim work and furniture building project. 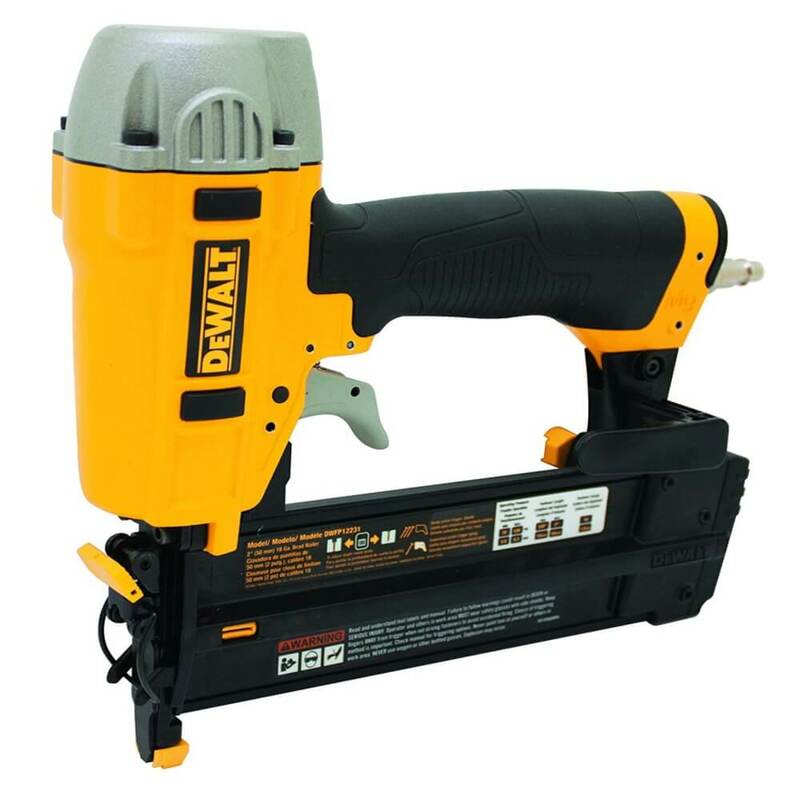 We are talking about DeWALT DWP12231 pneumatic brad nailer, that provides the power and ability to execute all kind of brad nailing task ranging from fastening decorative molding, casing, kitchen crown to installing shoe molding. Whether you have prior experience with the variety of brad nailer or no experience at all, you will be amazed by DeWALT DWP12231 for its simplicity and efficiency when you try it for the first time to drive 18 GA brad nails ranging from 5/8″ to 2″ in length for your DIY or professional project. We covered all the aspect of the nailer in this review so that you can form an informed opinion on quality and effectiveness of DeWALT DWP12231 in brad nailing task. The tool is shipped with typical black DeWALT hard case. Unboxing the tool for the first time you will notice the magnesium body of DeWALT DWP12231. 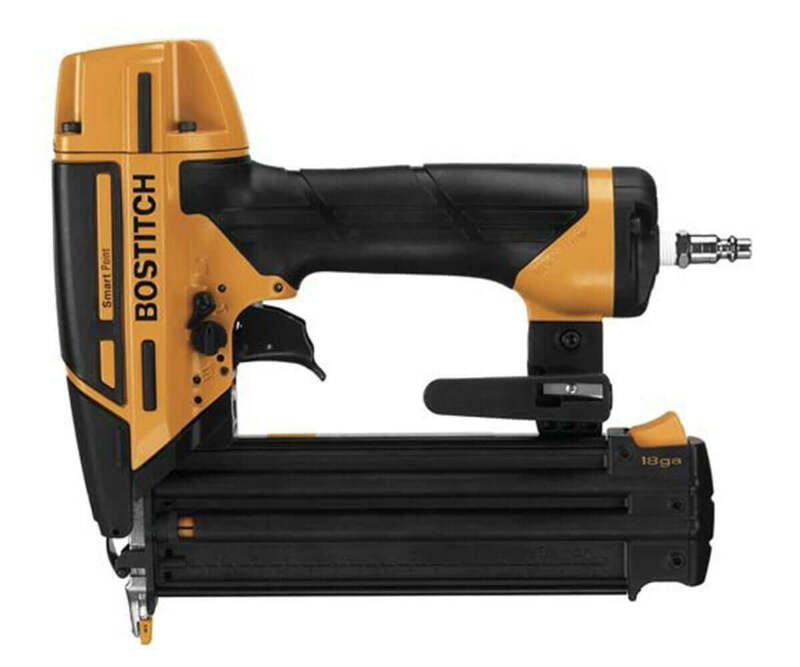 It delivers a strong and lightweight design and immediately you can see why we are suggesting, this is one of the best brad nailer available right now in the market. Compact design and dimension of the tool is easy to hold in one hand and you can start using DeWALT DWFP12231 18-Gauge brad nailer kit comfortably without any doubt. Dewalt DWFP12231 is built around a maintenance-free motor that not only have long life but also safeguard work surface from staining. Unlike most other pneumatic brad nailer it does not require any lubrication commonly referred as “Oil-Free Operation”. Rear exhaust prevents contamination away from the work area. DWFP12231 is also equipped with a removable non-marring nose tip with option for one spare storage on the tool. DeWalt design also incorporated user comfort by adding integrated rubber grip and adjustable belt hook to keep the tool near the user. Sequential style trigger of Dewalt DWFP12231 needs 70 – 120 PSI operating pressure to drive 18 Gauge brad nails from 5/8″ to 2″ which makes it ideal for fastening of interior and exterior trim, cabinetry and fine woodworking, cap and shoe molding, paneling, door and window casings, picture frames and window beading. Straight angled magazine can hold upto 100 glue collated brad nails that come with a low nail indicator window. The tool-free depth-of-drive adjustment with detents feature allows setting the nail heads properly, along with the tool-free jam release mechanism to remove nails easily. Getting lowest priced brad nailer may not be the answer to getting value for money. In fact, the price of the nailer alone is not sufficient to measure value. To make sure you’re getting the best value for your money, you need to consider the whole package you are getting. Moderate priced DeWALT DWFP12231 18-Gauge brad nailer kit really stack up against value for money for numbers of reasons. To start with, it comes with Three Years Limited Warranty and One Year Free Service Contact. We must say DeWALT hard case really make big difference when you compare with other models that only offered as bare tool. Hard carrying case keeps your tool safe and organize other accessories so that those are not lost. The package also includes 500 sample brad nails (1/4 inches), fitting and owner’s manual. DWFP12231 18-Gauge brad nailer kit embodies DeWALT quality philosophy to a great extent that you can easily recognise them from its impressive features affiliated to brad nailing. Superior Design: We are impressed with the lightweight magnesium body. 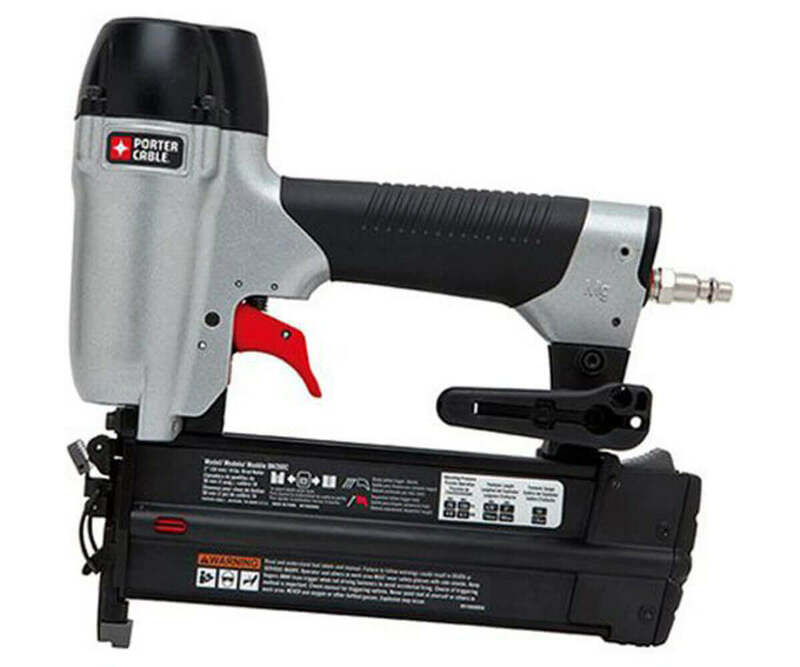 Magnesium body design delivers durable nailer with lightweight for longer usage without much physical burnout. Large anti-slip comfortable rubber grip gives greater control to the user. Sideloading magazine design with latch system for tool-free jam release eliminate use of Allen or hex wrench usually used for nail removal. Oil Free Operation: If you are not familiar with pneumatic nail gun then it will be hard to fathom how important oil-free operation means to pneumatic nail user. Typical air nailer needs regular oiling to keep it running and functional. For DeWALT DWFP12231, you do not need to worry about frequent maintenance or oiling. Core of this brad nailer is a maintenance-free motor that run without oiling, on top of that DeWALT quality assure long life. Super lightweight & Portability: DWFP12231 weight only 4.8 pounds, and this ultra light tool allows you to work all day long. Nailer is easy to handle and also gives easy portability. This tool can be carried around without facing any problem. Other Cool Features: DeWALT incorporated a bunch of impressive features along with other feature that are already discussed. Hard Carrying case with sample nail, ¼” fitting. DeWALT DWFP12231 almost became our choice for best brad nailer kit if it did not missed few crucial brad nailer feature. Dry fire lockout mechanism is missing in this nailer. Difficult to work in tight spaces with the straight angled magazine. Nail jam reported for some user. Not suitable for large-scale projects. Finding spares for some of the damaged parts fairly difficult. DeWALT is in the power tool business since 1924 and considered to be America’s one of the best hardware manufacturing company. Tool quality is not alien to the brand and we found DWFP12231 18-Gauge brad nailer kit received positive customer review based on the analysis of top online retail sites. More than 80% customer gave 5-star rating, and our own scoring system rated the tool at 8.42 out of 10. Our extensive rating system measured design, usability, ease of use and value for money to find the overall score. DWFP12231 undoubtedly an excellent choice for brad nailing for the fact that it is built and configured in such a way to satisfy DIY and home user, however professionals may not be happy with its performance. 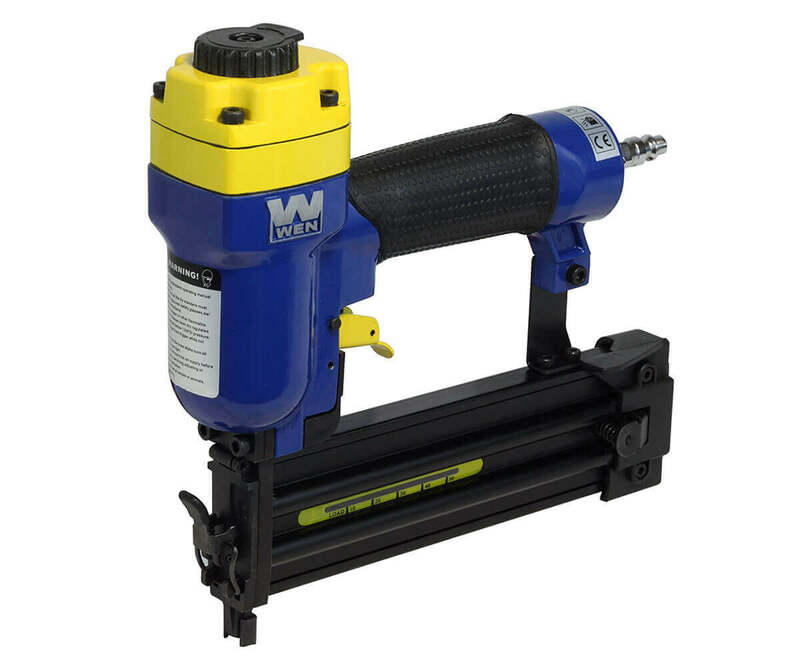 Having said that you must also consider there are few or no alternatives in the market that offer a basic pneumatic brad nailer with maintenance-free motor, lightweight yet powerful magnesium body, tool-less jam release mechanism and other cool feature sold at a moderate price. We found a large portion of our reader follow our review to compare their research and findings to make sure they are on the right track of identifying the best product for them. In case if you are not willing to go through extensive research to find out best brad nailer, you can confidently go for DeWALT DWFP12231 18GA Brad Nailer Kit without much hesitation for its all-round feature and few cons that are fairly compensated by its value for money pricing.